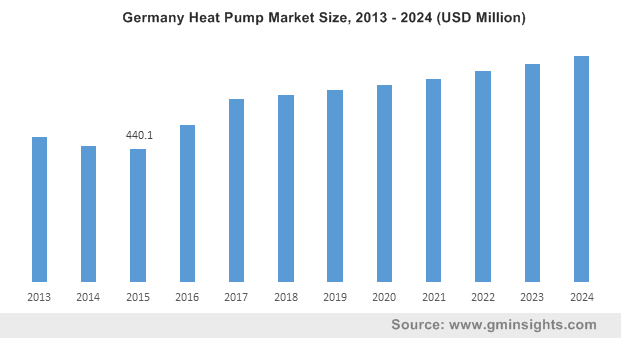 Germany Heat Pump Market size was valued over USD 600 million in 2017 and is anticipated to exceed an annual installation of over 100 thousand units by 2024. Germany heat pump market will witness an appreciable growth on account of. increasing demand for reliable, sturdy and energy efficient system to reduce electricity bills across residential and commercial establishment. Volatile fossil fuel price along with growing concern to reduce import dependency are some of the factors propelling demand for energy efficient systems. Zero interest rate loan, tax rebate, direct grants and financial assistances are some of the incentives introduced by policymakers to enhance the penetration of energy efficient renewable technologies. For instance, as per DOE, geothermal heat pump can reduce electricity bill by 30% to 60% when compared to traditional cooling and heating systems. Increasing focus to maintain sustainability of fossil fuel along with rising concern to curb the carbon emissions will stimulate the Germany heat pump market size. Government has introduced several energy-efficiency directives and norms to achieve the renewable targets and thereby reduce GHG emissions. For instance, the regulators across Germany have set a target to reduce CO2 emissions by 270 MMT by 2020, through promoting the utilization of renewable energy. In addition, in November 2016, Climate Action Plan 2050 across the nation laid target to reduce carbon dioxide emissions up to 55% by 2030 when compared with 1990 levels. Geothermal heat pump market will witness substantiate growth owing to its ability to utilize ground or water temperature for providing heating and cooling across establishments. Minimized heat transfer loss, low installation and O&M cost are some of the imperative parameters fueling the product adoption. Technological advancement in heat pump design to enhance its efficiency will further complement the business outlook. Ground source heat pumps are preferred over water source heat pumps owing to their ability to extract heat from ground by circulating antifreeze liquid through buried pipe. Air source heat pump market is anticipated to reach over 65 thousand units by 2024. Cost effectiveness, limited space requirements, and zero expense for ground work are key underlined parameters which will augment the industry landscape. The system can help to reduce greenhouse gas emissions up to 40% when compared with conventional heating system. Air to water heat pump are preferred over air to air on account of growing demand for water heating solutions. However, air to air heat pump is expected to witness growth on account of its potential for effective air purification. Sole to water in 2017, accounted for over 5% of the Germany heat pump market share. Growing demand for domestic hot water supply and space heating across suburban areas will propel the industry dynamics. Introduction of green building standards and codes to reduce GHG emissions will further complement the business outlook. For instance, Germany introduced Energy Saving Ordinance that frameworks mandatory performance requirements for new and retrofit buildings which in turn have inclined consumer perspective towards the installation of energy efficient technologies. Residential heat pump market is set to witness growth of over 3% by 2024.Increasing investment toward the refurbishment and re-establishment of buildings across the nation along with strengthening purchasing power parity will propel the industry growth. Growing awareness toward benefits of renewable energy systems coupled with shift in trend to improve living standards will further boost product demand. Commercial heat pump market is anticipated to witness robust growth on account of growing demand for HVAC system that can easily be integrated with conventional systems across the new constructed and existing buildings. The product finds wide application across healthcare, hospitality, retail, logistics & transportation, education and offices. Key players in Germany heat pump market are Trane, Vaillant, Viessmann, Glen Dimplex, Stiebel Eltron, Swegon, Thermic Energy, Solarbayer, Bosch Thermotechnology, Danfoss, Daikin, Wolf, Toshiba, Carrier Corporation, NIBE, Systemair AB, Modine, Weishaupt. The heat pump market across the nation is highly fragmented in nature with several collaborations, mergers and acquisitions being witnessed with an aim to increase global footprint and enhance customer portfolio. Moreover, technological innovation in system design has also been a key strategic implementation to further diversify the existing product portfolios. Heat pump is used to transfer heat from one place to another by circulating refrigerants through condensation and evaporation. It finds wide application across industrial, residential and commercial buildings for heating and cooling application. 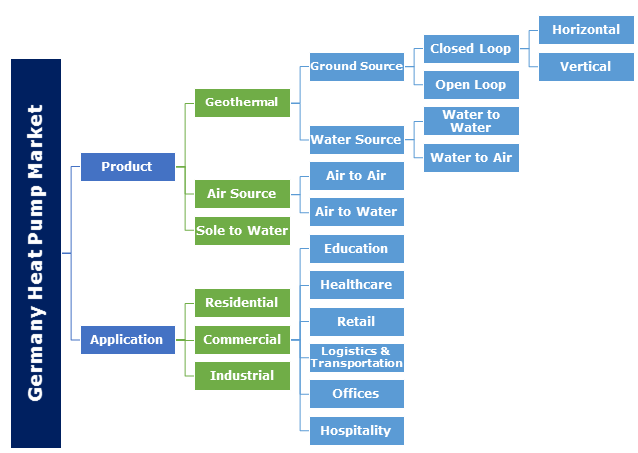 Based on sources, the heat pump is segmented into geothermal, air source and sole to water.